It’s not a NO-work homeschool group, but definitely LESS work. Still sound good? I’m the leader of my local homeschool support group. We’re pretty laid-back, so much so that I really don’t consider myself the “leader” … I fulfill more of a secretarial role in my own opinion. But most of the group calls me the leader, and in those few (thankfully VERY few) instances where leadership is called on to arbitrate disputes or deal with problem members, I get called on … definitely my least favorite part! But as for what we do, we have a framework or routine in place, and we’re flexible within that framework. We’re not a co-op; that is, we don’t offer cooperative classes, although within our group different people get together and form their own co-ops, such as the history co-op taking place at my house this fall. But that’s not what we’re discussing. Get Half the Planning Done in a Snap! Our homeschool group meets every Friday afternoon for some sort of group activity. Every other week (sometimes more often) is a park day that is just relaxed and the kids hanging out and the moms hanging out … very nice. Very conducive to building relationships and friendships and even finding someone who has kids just your kids’ age and who is looking for a teaching co-op in just the same subjects you’re looking for. We have a few activities associated with our park days, such as a book club that meets once a month during one of our park days. With half of your group meetings set as park days, half of your planning is done. Fini! I like to have it at the beginning of summer, because all the little changes we might want to make are fresh on our minds. I don’t know about you but after three months of travel and summer camps, I can’t remember what I was thinking six months ago that I wanted to talk to everyone about next time! The second planning meeting is right after Christmas, usually our first meeting of the new year. At these meetings we discuss when to have our semi-permanent days (parties and such) and what kinds of field trips and other activities we want to do on the other Fridays. We have several semi-permanent days set (semi-permanent meaning: we know we’ll have these events, but need to schedule the exact day). We always start off the fall meetings with a Kick Off Party (usually a pool party at someone’s house). We have a Fall Harvest Party each year, usually late October. Our Friendship Party comes near Valentine’s Day. And of course, there is a fabulous Year End Party at the end of May! We pencil in days for the group to attend the state fair (October), a “school portrait” day (October), the American Heritage Festival (November), and the Estrella War (a Renaissance-fair type festival put on by the Society for Creative Anachronism each year in February). We schedule a day for our own Academic Fair (March or April), and a day for assembling our homeschool yearbooks (April or May) (you might like our easy method of making a personalized yearbook for your homeschool group!). We also schedule in our regular recitals at a local senior home, which we do two or three times each year, and Christmas caroling at the senior home as well. Our TnT group (tweens-n-teens) hosts an annual charity yard sale (they raised almost $1,500 this year for a children’s home in Africa! ), so we pick a day for that too. We like to volunteer as a group for Feed My Starving Children, so we’ll put that on the schedule for once or twice each year. As you may imagine, these semi-permanent activities coupled with the regular park days take up a LOT of time on the schedule. In fact, the fall schedule is so crowded, any field trips we want to take are usually pushed over to January and February! With so many “already scheduled” activities on the books, the weekly planning that can be so burdensome when just one or two people are doing all or most of it becomes much easier to handle. In addition, with regular park days interspersed with the more energetic field trips and other outings, the kids (and the moms) have plenty of time to get to know each other and create real friendships. 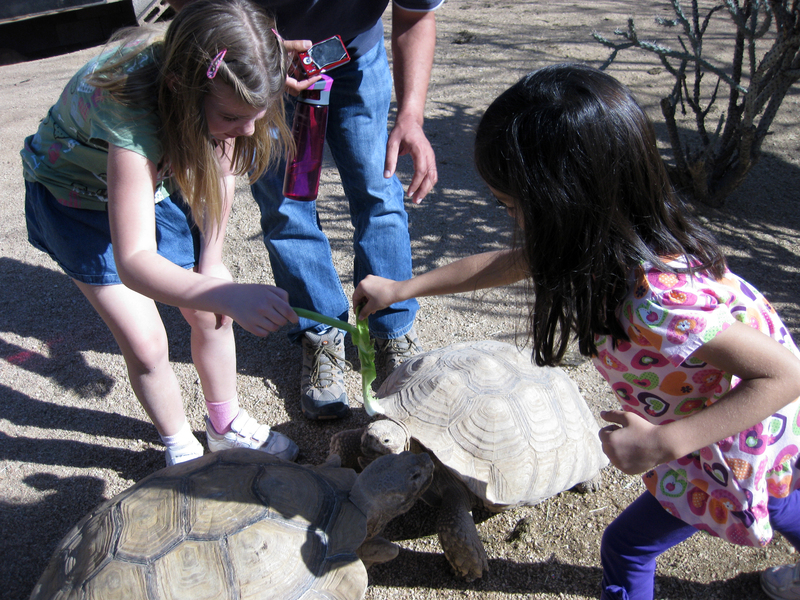 And there’s still plenty of time for feeding giant tortoises at the herpetological society when the opportunity arises. We encourage participation in the two planning sessions, asking people to bring in ideas for things they want to do, field trips they want to take, etc. While we make it a point that anyone can bring in an idea and does not have to be the one executing it (for instance, someone might have a great craft activity but not a home that will host everyone), we do encourage everyone to participate as they can. I find it is much easier to garner participation in a face-to-face meeting by sending out a plea over email! As we discuss what we’ll do as a group, if someone brings up an idea for a field trip, I will encourage them to find out the details of what we need to do to get it scheduled, and then I help them as needed to get it onto our schedule. I do end up planning and carrying out field trips and such for many of the unscheduled days that are left, but it’s not so many that it becomes troublesome. I and a couple of other moms keep our eyes open year-round for attractive opportunities and pop them into the schedule when the time is right. I find this is a pretty easy, low-key, low-pressure way to run a homeschool group; at least it has worked for us for over half a dozen years now! But I admit, our sister group in town has it even easier: they have ONLY park days. And that works too!